Independence City Hall is located at 555 South Main Street, Independence, OR 97351; phone: 503-838-1212. Photo: James S. and Jennie M. Cooper House, ca. 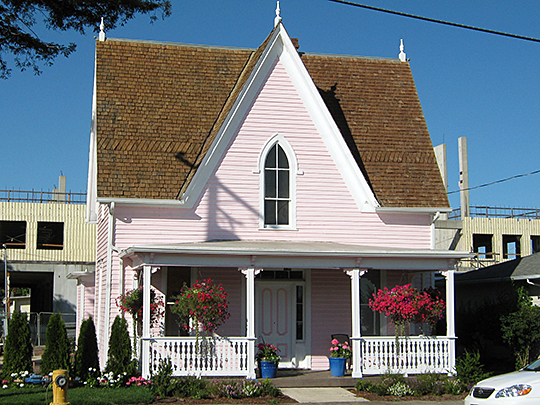 1875, 487 South Third Street, Independence, Oregon. Listed on the National Register of Historic Places in 1988. Photographed by User:Katr67 (own work), 2008, [cc-by-1.0 (creativecommons.org/publicdomain/zero/1.0/deed.en)], via Wikimedia Commons, accessed January, 2013. Elvin A. Thorp arrived in the Independence area in 1845 and staked a claim north of Ash Creek in June of that year. He platted a small townsite which later became known as "Thorp's Town of Independence" or the "Original Town of Independence." Thorp and his family came to Oregon from Council Bluffs, Iowa by a wagon train lead by his father. The party left the midwest in May 1844 and arrived in the Oregon in 1845. Elvin Thorp staked his claim on land north of the present site of downtown Independence. His land was bordered on the south by Ash Creek and on the east by the Donation Land Claim of C.P. Cook. Thorp staked his claim six months prior to the establishment of Polk County. In June of 1845, Thorp petitioned the United States Government to lay out a small township called Independence. Thorp received the patent for the town in February of 1866. He knew the importance of the town's proximity to the Willamette River as a strategic transportation route for shipping goods up and down the Willamette River. He thus secured a road easement through C.P. Cook's Donation Land Claim so he could access the valuable waterfront and dock space. This helped to promote the town's development. The town was reportedly named after Independence, Missouri, by an early pioneer, Mrs. Thomas Burbank, who lived several miles to the southwest. Independence, Mo. was not only the starting place for the Oregon Trail but is reported to have been a home to Thorp at one time. He was said to have consented to name the town with the stipulation that the Burbanks move to the town and build a store. This was a common practice to encourage settlement in a new plat. By the mid-1850's, "Thorp's Town of Independence" or "Old Town" had services such as a sawmill, brick kiln, blacksmith shop, livery stable, a ferry system which ran across the Willamette, a general merchandise store, warehouses and boat docks and a post office (established April 3, 1852). The small town prospered as a key shipping point of goods and supplies for the California gold rush and was situated in a strategic location for the transportation of goods and produce shipped up and down the Willamette Valley. The town's success ended abruptly after the flood of 1861. A rainy fall and an unusually warm December melted the snow pack in the mountains causing a flood in December of that year, which left the town devastated. The flood destroyed "Thorp's town, with it's highly cultivated and beautiful surroundings, has long been the center of one of the most productive agricultural districts in Oregon. The farmers from a wide extent of country come to do their trading." The article further states of the small valley community that "Independence, on account of the opportunities for trade, it has long enjoyed, is one of the most opulent of the small towns to be found in the Willamette Valley. It claims a population of about 1,200, and possesses sixteen brick business houses. Its merchants are prosperous, and carry large stocks of goods to meet the demands of the large number of farmers who come to do their trading." The town grew as a central shipping point of the valley with various shipping companies locating their warehouses and wharves on the waterfront of Independence. The town also had a very active Board of Trade which was organized in the 1880's. Independence Historic District, Independence, Oregon, nomination document, 1989, National Park Service, National Register of Historic Places, #89000048, nrhp.focus.nps.gov, accessed January, 2013.